Like most textile arts, knitting was not historically an art form. It was a practical craft. In the British Isles, knitting sweaters, commonly known as ganseys, was what people did to clothe themselves and often to make a few shillings on the side. The knits for fishermen provided warmth in harsh environments, but they also were palettes for creative and talented knitters. Traditional patterns often passed from mother to daughter, but were rarely written down. Almost certainly, some of this history has already been lost. We can thank Michael Pearson for helping to preserve the history. And now, we can thank Dover Publications for reissuing an expanded edition of Michael Pearson’s Traditional Knitting, Aran, Fair Isle & Fisher Ganseys, which was first published in 1984. This book is a classic and of interest to anyone interested in knitting for the author includes not only historical perspectives and photographs, but tips and patterns for the modern day knitter. It was almost too late when Pearson embarked upon his project to find and document knitwear in fishing villages and communities in Great Britain. In some cases, he was too late, in which case he relied on those who preceded him as well as some collections and local museums. The knitters he met were like most knitters today--gracious and eager to share. He only had one instance of refusal. Compiled from personal interviews with knitters and their descendants in fishing villages around the coast of Great Britain, Pearson documents a history of personal and contract knitting among coastal fisher families in the British Isles. Knitters will find a wealth of inspiration and patterns. 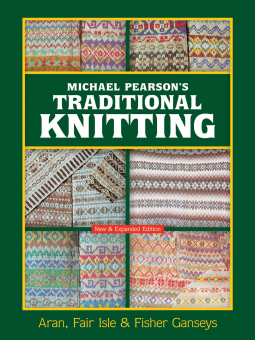 In addition to history, Pearson provides complete patterns along with knitting tips and how-to’s throughout the text. For example, to resolve a common problem of an unsightly column of stitches where the knitter changes needles in knitting in the round, he advises varying the crossover point to even the tension. After reading the section of Fair Isle knitting, I'm ready to discard my pseudo-‘Fair Isle’ sweater, which is far from the traditional style. The photographs in this section are particularly beautiful, showing examples of the patterns within patterns and vivid color work. I particularly liked the color photograph of Fair Isle knit in the varying natural shades of Shetland ranging from the darkest brown to Shetland white. I really enjoyed reading this book and now need to find a place for it on my reference shelf. It’s that good.